Dave Mustaine is a visionary, there is little question of that. He knows what he wants with each record and goes for it. With this one, “precision” was the word of the day. 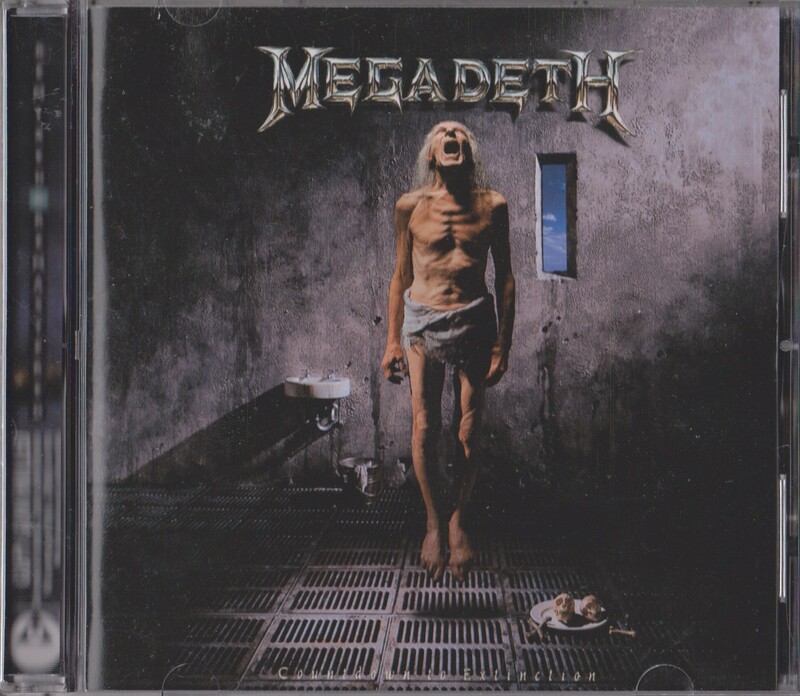 Recorded digitally, Countdown to Extinction is perfection embodied. Not one bum note, every beat is metronomically correct. So what could possibly be improved on a remaster? This excellent series of Megadeth remasters are actually all remixed from the original tapes. This was done with Dave himself at the helm, still the perfectionist. Countdown being flawless already, I’m sure he didn’t have to do much remixing. You can hear some changes and some additional effects added here and there, and some different takes of instrumental tracks. In general though, the differences are the kind only diehards will notice. This CD sounds three-dimensional even on the cheapest of sound systems. Dave Mustaine, this is your Sgt. Peppers! I won’t even bother discussing the tunes. You know them all anyway. “Symphony of Destuction”, “Sweating Bullets”, “Foreclosure of a Dream”…they are all excellent examples of technically sharp and aggressive heavy metal. For bonus tracks, you get one hard-to-find B-sides and some interesting demos, but not the coveted rare Trent Reznor remix. Aw yeah… I thought ‘hey I’ve got this, I heard it recently!’ Nope, what’s here is the CTE Live album! Now, in explicably, I do have two copies (why 2?) of the album proper on cassette (So hot right now). Seems like a CD I would have though, right? Nope! I’m glad the remaster is cool but for me, it wouldn’t really matter (as you pointed out). I’d be too busy rockin’ to notice many changes. Isn’t it frustrating when they don’t include ALL of the bonus tracks possible? Like, would it have killed them to throw the Reznor track on and be done with it? Until I saw that still in the clip, I’d no idea that Dave M was David St Hubbins’ twin brother. The only MegaDave album I listen to albeit the new one sounds pretty good as well. I have the deluxe with a San Fran concert from 93 on it and the band is on fire! 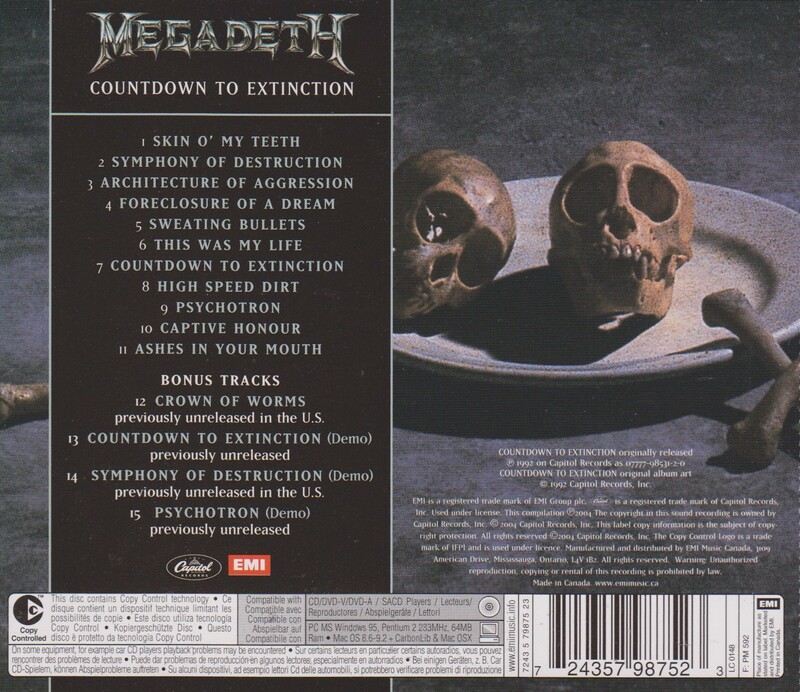 Over the years I eventually warmed to Countdown if forced choosing it over the rest of the catalog albeit Rust an incredibly close second and Youthanasia always a nostalgic favorite. Peace Sells & Rust in Peace are on the 1001 – but if this is his Sgt. Pepper, perhaps it ought to be too! Oh. I only have Rust In Peace and, aside from that, I’m only familiar with the track from Last Action Hero. I’ll check this one at your recommendation! Man, this is one kickass album!